Went river riding this weekend with a buddy and instead of taking our regular atvs (ATC 200x/Scrambler 500) we decided to take the smallest machines we could find. 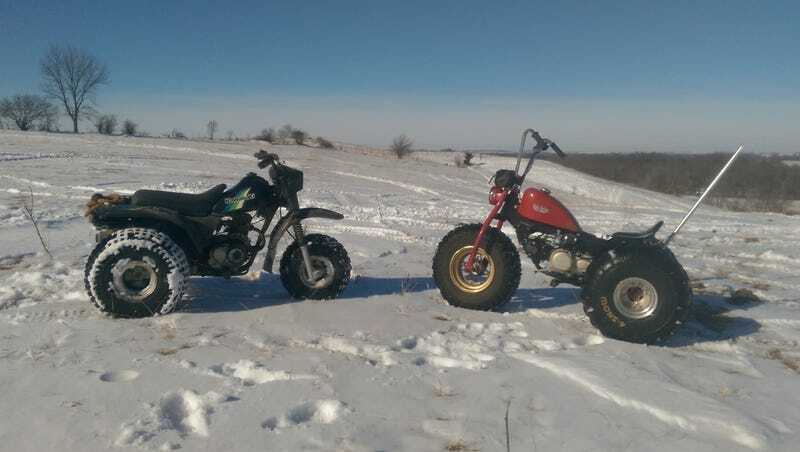 My buddy showed up on his KLT110, and I brought out the ATC90 chopper trike. There were probably 100+ machines out on Saturday and we were by far the smallest machines out there, but I guarantee we had more fun than anyone else out there, and everyone loved the little trikes. This was the first real outing for the little chopper trike and overall the thing was a champ. I had to switch tires last minute due to a leaky tube and the snow tires I have on were much taller than what it’s really geared for. Even still, I ran it wide open in low range high gear all day and it never hesitated. We rode roughly 12-13 miles upriver, stopping at a few sidings for some hill climbs, ate lunch at a local bar, then rode back to the truck. By the time we got back someone had carved a long oval track onto the river so we ripped around that for a while which was a blast. A couple laps in my machine started running rough, cutting out and falling on it’s face at WOT (head pipe came loose). After getting my non-doors blown off by a YXZ100oR (side note, OMG waaaaaaaaannnntt), I figured I was just getting in everyone’s way so I pulled off and let my buddy keep running. A few improvements will need to be made to the chopper trike. While my tall slash cut exhaust looks bitchin, it’s crazy loud and obnoxious and needs to be changed, and the head pipe attachment needs to be better secured. The new carb I put on has a really stiff spring, and with the thumb throttle needing to be mounted in an awkward spot due to the new bars, a twist throttle needs to be installed. I need to fix that tube leak because the tall tires and tall gears make it too difficult for this little trike to pull me around well. Overall though, super fun day and I can’t wait to do it again.